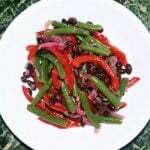 Salad featuring green beans, black beans, pickled onions and red peppers in a briny mustard vinaigrette. Perfect for a picnic! In a saucepan, combine the vinegar, half of the lemon juice, 1/2 cup water, sugar, coriander, salt, and a few grinds of pepper. Bring to a boil and cook for about 2 minutes. Place the bell pepper and onion in a bowl; pour in the brine. Let cool to room temperature. Bring a large pot of water to a boil. Add a little bit of salt and the string beans. Cook until tender, but still crisp (about 5 minutes). Drain and rinse with cold water. Place string beans and black beans in a large bowl. Measure out 1/4 cup of the brine that the vegetables are soaking in and place in a medium bowl. Whisk in the remaining lemon juice and the mustard. While whisking continuously, add the olive oil in a steady stream. Continue whisking until smooth. Drain the peppers and onions. Add the vegetables and dressing to the bowl with the beans. Toss to combine. Cover and refrigerate at least an hour. Season with salt and pepper before serving. Your string beans don't need to all be green! Throw in some purple and yellow beans if you can find them. Don't feel like making your own mustard? Dijon or stone-ground will do. The sodium count may be misleading as some of the salt gets poured off in the brine and the cooking water for the beans.